If you are a beauty addict like me you would know that Tea Tree has many good benefits for the skin. One of the most popular TeaTree use is for spot treatment. An anti-inflammatory such as help to reduce redness, irritation and swelling. It can help to shrink you pimples faster. Good news isn't it? Anti-bacterial / antiseptic which can help to prevents infection. I can help to clear the clogging pores and build up oil on the skin. It is not advisable to buy the tea tree oil and apply directly on the skin. You may put your skin in high-risk condition. In this case, I would say the commercial product contains tea tree oil is so much safer for us to use rather than DIY recipe which is floating around the internet. 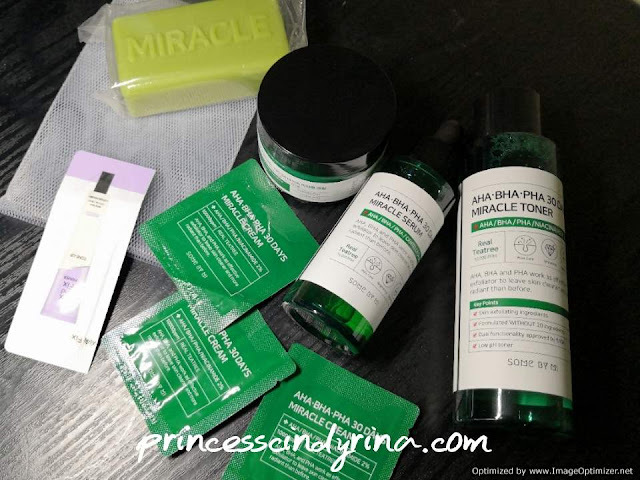 Recently, I have a chance to try out most famous Some by Mi product AHA, BHA, PHA 30 days Miracle series with Real Teatree as main ingredients. It was fascinating to watch all those Korean YouTubers and others review on how miraculous of this product from Some By MI. Even one of my colleague bought their Toner to get read of the spot on her face. Now I have the chance to try out personally. I tried in around 5 days now. I don't really see any miracle happens on my skin yet. I notice one thing, after applying this for a few days, my skin very much cleaner. Especially pores and also the dead skin seems has been exfoliated well. It looks more radiant. 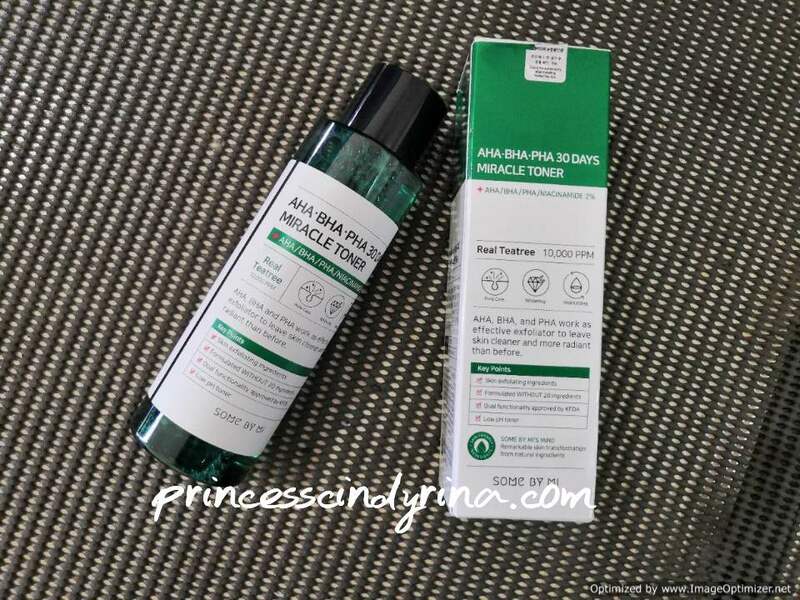 How to achieve a remarkable skin transformation in 30 days using Some by Mi AHA.BHA.PHA Miracle series? First, you need to know what is AHA, BHA and PHA. It now just 3 familiar alphabets. AHA - Alpha Hydroxy Acids. * It helps to softer and smoother surface by dissolving the bonds between dead skin cells for easier removal. * For those who have blemish -prone skin is advisable to start using BHA for your skin. * least well know and for skincare acid but it is almost similar to AHA only it comes with larger molecules. So the penetration into the skin is less thorough. * Example of PHA - gluconolactone and lactobionic . You can look out for this on your product label. What is my experience using 4 Steps of Some By Mi AHA.BHA.PHA 30 days Miracle series? 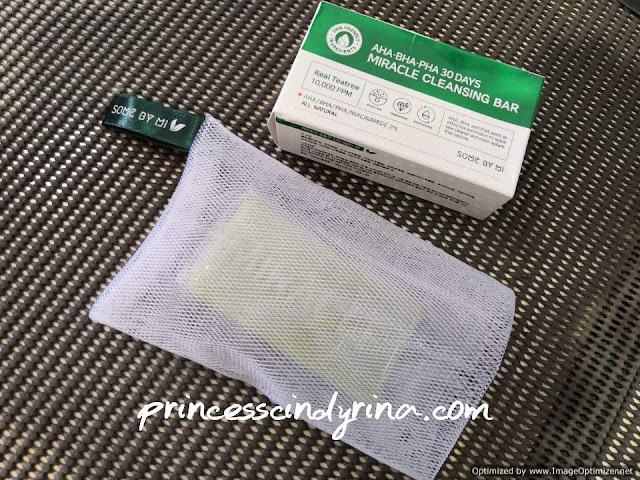 Honestly, I never recall when is the first time using the cleansing bar as my skincare routine. Really not fancy to include this kind of cleansing form. It is really hard to store it in a hygienic way after using it. If we are not careful certain bar soups are full of skin-stripping ingredients that will leave your skin dry. Since it was delivered to me. For benefit of doubt, I started using it. One thing, I really glad it came with soap net. Bar - made with sodium hydroxide but if you get the formulation right, it will disappear and left only with soap molecules and moisturising glycerin. Bar formulating allows a higher concentration of pure, good for skin ingredients. This is also the most eco-friendly because of the packaging. My experience after using the most awkward cleansing method ever in my life. Just rubbing the soap rubbing net provided by Some By Mi for around 10 seconds and you will get a nice soft foam to apply on the skin gently. I find that the cleansing bar from Some by Mi doesn't dry out my skin at all. In fact, it feels my skin feel a lot cleaner after the cleansing ritual. I have a very high expectation when trying out this miracle toner. Why? Some By Mi AHA.BHA.PHA 30 days Miracle Toner become a good beauty sensation for its effectiveness. I saw this girl video who miraculous cure her acne scar over 30 days using this. * The texture of this toner is really watery but easily absorb into skin though so no need to worry about your skin getting soaking wet. * The packaging really have some good common sense because it comes with some sort of stopper on top of the bottle so you don't find pouring an overflowing watery toner and waste it away for no reason. * It has a minty scent comes with it. I use TeaTree before so I know how it smells exactly. That minty scent is totally mysterious to me. * I thought this miracle is just by name and over sensational products. I was wrong! I have one acne scar on my right cheek and over 5 days using this toner twice a day, I can see it slowly reducing the scar. DAEBAK!!! I hope it disappears after 30 days. I will continue using this. Most of the serum I use is kind of sticky and it kind of slippery and not so easily absorb into my skin. My first day trying to apply this serum in a most graceful way of 'so-called beauty blogger' way, I end up drop the serum into my eyes.Ouch!!! !..That's hurt! no joke. Careful ...don't be like me. I just for-go about doing it the 'graceful way'. I will apply it my way. Just a few drops to my palm and place both palms onto my face gently and let the serum absorb by itself. Pleasant feeling though! It's not sticky like any other and this makes my skin supple and soft. For growing old gracefully sake, don't ever for-go serum from daily skin care routine. As you age, serum is an important element to the skin. When I read one of the ingredients of this Miracle Cream includes 70 percents Centella, I was like....count me in for this one. Why I go for it? Centella is a herb famous with amino acid, beta-carotene, fatty acids and phytochemicals. With all these blends, it becomes a powerful anti-ageing property. For ageing skin, it is important to incorporate Centella into a skincare routine. You will find that this will benefit in supporting skin's underlying structure and helps to fend off that wrinkles and loss of firmness. It helps to boosts up antioxidants, strengthening skin and increase the blood circulation. For those who are suffering from eczema, acne and blemishes can benefit from this too. 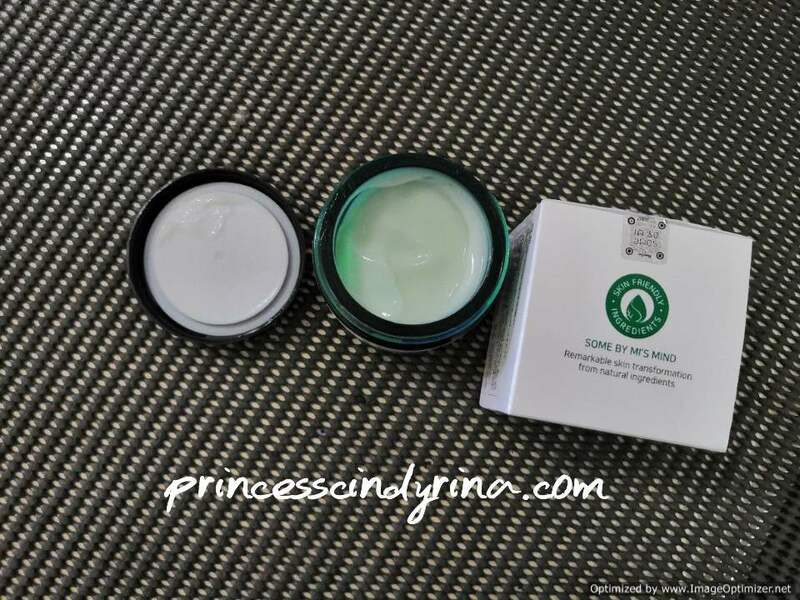 The texture of this cream is not really creamy to me it almost watery but surprisingly it goes easy when applying on skin. My kind of moisturising cream. Will I recommend 30 days Miracle series from Some By Mi? If you have that acne scar and looking out to reduce it, please try this for over 2 months and you will see the difference. 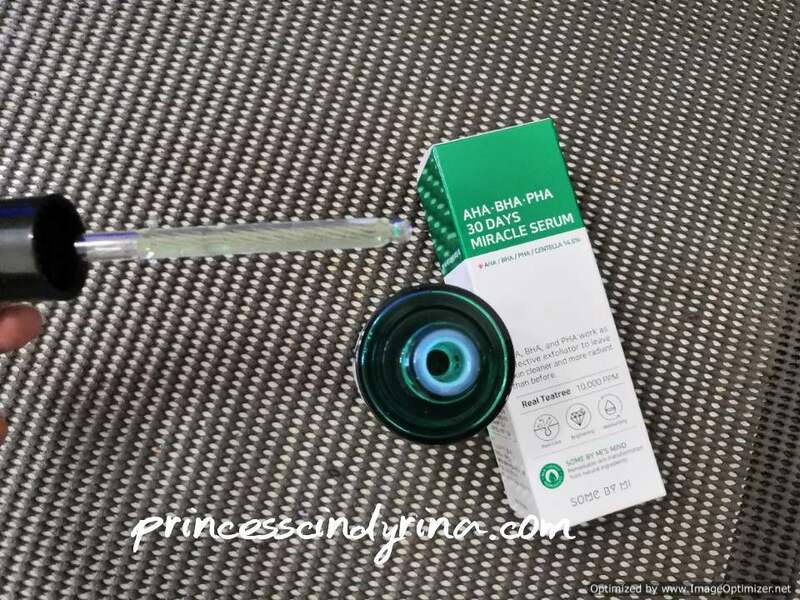 Where to get your hands on original Some By Mi Product in Malaysia ? Check below video for Some By Mi Unboxing Experience. More and more K Beauty products coming up on our shore and the best thing is, our skin agrees on them! I might try them soon too. yeah love this range as suitable for my skin. Price is reasonable too, my favorite is soap and toner. Women are now very easy to maintain as there are so many good and quality products out there. This could be the case for men's products. Hi there! I really love your sharing on Korean skincare routines. How much is the price for the whole skincare set that you used for? 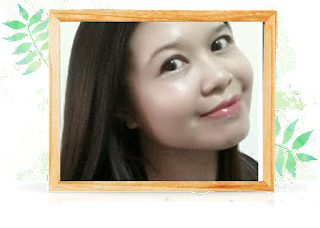 Would love to try it out as Im still looking for suitable skincare products for my skin. i love to used product contains tea trea. There's lot of benefits for our skin. Btw i feel i just fall in love with the cleansing bar. The packaging is great! OOhhh I just love anything tea tree, the smell just gives me the calming effect like no other. 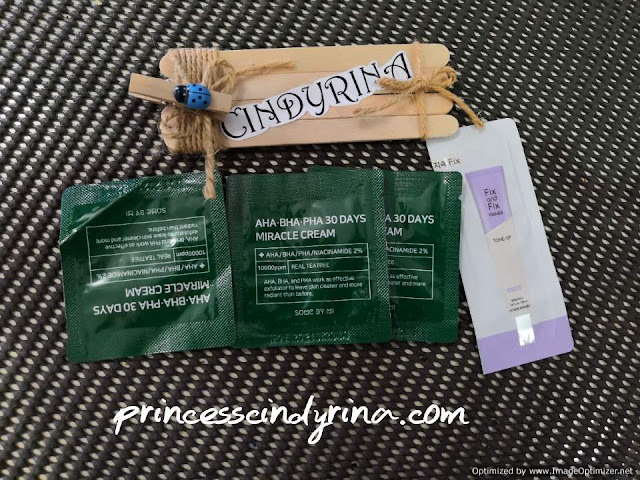 it's so great to have a range of products like this.. great to have remarkable skin after using the products..
Actually product yang ada AHA BHA semua tu bagus untuk kulit.sangat2 bagus.so apa yang u share dalam artikel ni sangat berguna for those yang looking for good skincare. i love products with tea tree too. thanks for sharing this awesome product. worth to try the complete set. I've seen thethis reviews by Korean bloggers it works like magic, removing all those acne, good to know it's now available in Malaysia. First time dengar jenama Some By Mi. Nampak menarik sebab dari tea tree kan yang memang bagus untuk kulit. Set dia pun lengkap. Hopefully sesuai dengan kulit i yang berminyak ni.. Seriously baru tahu tentang the new '.HA'. Good la this product, lain daripada yang lain. This brand is new to me but looks like their products are quite intensive too. I like the AHA.BHA.PHA 30 days Miracle Serum and will check out on that.